Regiment/Catrawd: 78th Siege Battery, Royal Garrison Artillery. Service Rank and Number / Rheng gwasanaeth a rhif: Gunner 156286. Military Cemetery/Memorial / Fynwent milwrol: Wailly Orchard Cemetery. Pas de Calais. Ref No Grave or Memorial / Rhif cyfeirnod bedd: Plot: 111.Row: G. Grave: 2. Medals Awarded / Medalau a ddyfarnwyd: British War Medal and Victory Medal. James Henry Parry was born in Holywell, Flintshire during 1888. The 1911 Census states that the family lived at 1 Red House, Holywell, Flintshire. The head of the family was James Parry, a Widower, who was 56. He was employed as a Woollen Carder in the Welsh Flannel Mill, Greenfield Road, Holywell. (Carding involved getting all the fibres running in the same direction. This was a skilled process involving the use of a brush with spikes, and was originally done by hand. A Carder was normally a very experienced worker). He had 6 children, Joseph Edward Parry aged 26, a Lead Smelter, James Henry Parry aged 23, a Woollen Card Cleaner, Margaret Jane Parry aged 20, a Flannel Weaver, Caroline Parry aged 17, also a Flannel Weaver. They were all employed at the Welsh Flannel Mill. Mary Ellen Parry aged 28 and Muriel Parry aged 14. James Henry Parry subsequently married a Gwladys Mary Parry on 22 April 1912 and they lived at 13 New Houses, Strand, Holywell. On 12 November 1918 a payment of £3.12s.9d was made by the War Office to Gwladys, this being monies owed to her husband James. On 2 November 1919, a further payment which is recorded as a War Gratuity of £4.0s.0d was also made to her. There is a Flintshire Roll of Honour card for James Henry Parry at the County Archives Office, Hawarden, containing very little information. Details of his medals were obtained from (www.forces-war-records.co.uk). 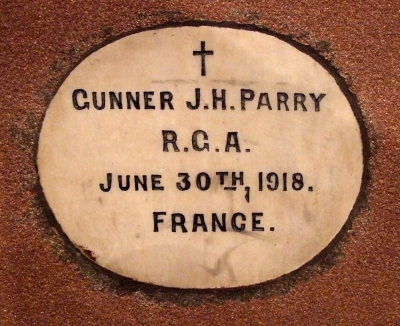 James Parry’s grave in Waillly Orchard Cemetery not far from Arras in France. The cemetery is poignantly and appropriately planted with apple trees. Photograph taken on 15th October 2013 by E & V Williams.